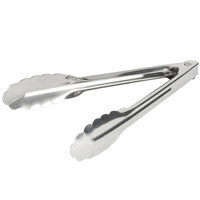 This pair of versatile 7" heavy duty utility tongs is a must have for any food service business! It features classic, scalloped edges, ideal for use in a variety of settings, from back-of-the-house grilling, to buffet stations, and even table service. This pair of heavy duty utility tongs is made of strong, 20 gauge stainless steel with a coil spring for both durability and longevity under everyday use. We use these on our fruit topping bar at our frozen yogurt business. They are good quality and a great price! I bought extras to use at home and I couldn't be happier with such a great value! Very durable and high quality design to these stainless steel tongs. Not long enough to use for grilling but definitely can be used on the stove top. Cute tongs. Received as described. Small size good for appetizer service. Make sure this is the size you want, I thought I ordered the larger size but kept them anyway. Good for cheese trays, bread. Very good small tongs. The size helps me feel like I’ve got good control over them because I have small hands. With these I know I’ll be able to reach exactly what I need with precision. I wish they had something in the handle to help push the tongs together when not in use, but a small rubber band or twist tie will do. I love that these are heavy duty and that they are so much stronger then your normal tong. They are perfect for in my kitchen. This 7" heavy duty stainless steel tong is a good size for home use only. It's heavy duty and it has a good grip on finger food. Exactly what I was looking for! These are going to work great for serving fruit, veggies, appetizers, and other smaller items. I can't believe the low price! Wish I had ordered more. We use these for everything! Super convenient and heavy duty. Daily use and multiple washes per day haven't fazed them a bit. Will be ordering more soon! We purchased a few of these tongs they are durable and dont bend like other tongs we had. Also its easy to clean its made from good material. We recommend this product. These have been the best steel tongs our restaurant has been faithfully using daily for a few years now. They are durable, easy to clean, and a great price. A must have item I would say. Theses work awesome for everything. We use them for Church, Weddings, and for School activities. They are just the right size for kids and adults. The 7" tongs are perfect for working in small pans over a stove. They store easy and don't take up much room, but are just as strong as the longer versions. Yes ! Love heavy duty, stainless steel tongs. ! These tongs are made extremely well . we use for kitchen sandwich table to pick up thing . It grabs the smallest piece of food, and it is Very convenient during the prep. I would recommend for cooking at high temperature a bigger size. Great for salad. Smaller size makes these great for smaller spaces like campers. Every time I get an order I want to place another one. Simply cannot beat the quality. Love these suckers!!! I till have them to this day and I ordered these over a year ago. Great wash in the dishwasher. It doesn't get damaged. Good size of tongs and very sturdy. 7" is a good middleground to 10" which can feel excessively large. Does mean you have to be much closer to the pan. This 7 inch heavy duty stainless steel utility tong is sturdy and a great kitchen tool. It is great for picking up foods off a plate or a frying pan. the tong was a good addition to my fruit and veggie table. it is not too long or too short. it is easy to use even by the young ones. I will recommend it. The quality is awesome, every parts feels undestroyable. However i found it a little too taxing for continues use. I brough two of these tongs. I love these tongs! We initially bought them for our wedding dinner, but afterward they were integrated into the kitchens of most of our family- the folks that took them home after the reception loved them more than the party favors! We use ours every day, more so than our 10” tongs. The quality is great and they feel sturdy in your hand, the shorter length gives you a bit more control when picking up holding food. If I didn’t still have 3 sets in my kitchen drawer, I would 100% buy them again. These tongs are boss! They are constructed from a heavy duty stainless steel and they have a nice weight in the hand. Great for cold food items. Good price and well made tong. These are essential for a kitchen and catering business. You can never have too many. They are pretty enough to use on our buffet line too. Well made and sturdy easy to grip all different kinds of foods. These were delivered quickly and packaged well. The tongs have worked great for 4 months of constant use. Highly recommended, short tongs are great for having good control of whatever food you are cooking. These served their purpose. They are a little difficult to use and have a tendency to want to pop out of your hand while serving yourself. Lol. Of stainless steel, this tong has a heavy duty structure. It is seven inches long, and the scalloped edges are especially beautiful. Also, this can be utilized for ice tongs! A tong that offers the same function as most others, but this stainless steel product is much more durable. The price compared to plastic ones are pretty decent as well. A great set of tongs that are well constructed and perfect for numerous uses The 7" tongs are lovely and great for serving cookies and brownies. Look no further when looking for a nice heavy duty tong. I use mine daily in the kitchen and they are holding up to all my abuse. Very durable at an affordable price. It is really heavy duty stainless steel utility tong. Very good quality and durable. I find it very easy to hold as the spring in it is very strong. It is important to our team to carry various types of utility tongs in our supplies. These tongs can be used for cooking application and double as a serving tool for a buffet style event. They are 7" long and feature a locking mechanism when not in use. Well when they first arrived I thought they were too small, but as I got to use them they are perfect. the sizes is perfect I use them to finish off condiments on tacos tostadas. Very strong and great price. These are very lightweight- flimsy I'd say. I'm not sure if they will hold up under frequent use. Would probably be ok for infrequent catering/buffet use. rice point is unbeatable for the quality and ruggedness of this product. There are cheaper versions but they don't come close to holding up like these. Great tongs. Theyre easy to clean, able to grab small or big items. They never break or fail us in any way. I love them. These tongs are great because you can cook not food with them and they won't melt theirs is the best price you can find around. These are a little hard on the hand to compress. I found them a little awkward to use. However, they do the job. They don't have a way to keep them closed, so storing them takes up a lot of space. I just love these little tong! They are so heavy and strong for such a cheap price. I bought them to use on a buffet for fruits and veggies and they have now made it to my personal kitchen. They are perfect for smaller items and foods! I will likely purchase more! These don't feel as sturdy as you would expect the "heavy duty" tongs to be. The hinge is a little floaty. There are the perfect size for the make table though. I needed a small tong to go with a small Yakatori grill. It is a durable little tool. I will be ordering the larger sizes too. 7" Heavy Duty Stainless Steel Utility Tong these are amazing, lovely quality and heavy duty, nothing flimsy here, I need more of these in my life. These tongs are perfect for breading applications. One for the egg and another for the flour and seasoning mixture. I only wish it had the ring to keep these closed when not in use or in storage. Great tongs, nice for many tasks such as tossing and serving salads or flipping smaller things out of a pan to serve. Great heavy duty material. I use these tongs almost everyday! They quickly became an essential part of my kitchen, and I use them with every meal. I use them during the cooking process and when serving. They wash well and are a great size in my hand. Heavy duty material but the spring is way too heavy. I have another brand that is similar but the spring tension is much lighter which is what you expect with a small tong used for more delicate tasks. Several of my cooks have had them pop out of their hands while using if the tongs are wet or their hands are. I will probably throw them away and purchase the other brand I have to replace them. Highly recommend for any restaurant or home. Great tongs that work well with any roll or meat!! Great price. Ordered and ordered again!! They are tough. Durable item that holds up for high volume and everyday use. We have roughly 50 pairs between two restaurants and haven't had an issue. Will buy again. This is a very simple pair of tongs. They aren't fancy, but at this price and quality, they're a bargain. Should last for many years. I am so happy that I bought these. So many times I have tried to use my large tongs when plating and it was always a challenge. With these, it is very easy to get just the right amount of garnish. Also very handy with shrimp or sushi. These are the perfect size for serving. They are very heavy duty and will last a life time. we enjoy having these around for serving hot wings and other hot fried food. These are the perfect size for serving side dishes at our family style establishment. They fit in small bowls without falling out the top and can easily be passed around the table. Durable and sturdy. so, i will admit straight away that these tongs just don't work for me. they are very small which is nice for delicate tasks but because they are "heavy duty" the spring/snap mechanism is veeeerry strong so its difficult to close them without gripping close to the tong ends, which sort of defeats the purpose of using tongs to begin with. i just think it's a slight design flaw. the tongs themselves are very solid though, so theres no manufacturing issue or anything. I totally like this thong, easy to clean and used a lot every time I do a Chicken, and pork BBQ and also grilling vegetables. These are great! They have an extremely strong resistance to them giving you the assurance that you will be able to grab just about anything. These tongs are great. We use them for picking up meat to portion into our authentic tacos and we couldn't be happier about their efficiency. I love the size, these tongs are petite and cute. The metal is dense and they feel sturdy. However, the spring on these is intense! They are hard to use because the spring offers so much resistance. I would not buy them again unless I knew the spring resistance was change. I know they say heavy duty, but the spring does not need to be so strong. 7 inches as it turns out is fairly small, so unless you have smaller hands (mine are average) or you want this to be safe for kids (I don't have any) I suggest getting a bigger one. I now use this, since it is smaller to pick out things in the likes of soup, broth, stew etc as it is a bit more precise than your average tong but I do plan on ordering a larger one to handle meat and other bigger food products. Disappointed. The spring mechanism is way too strong on these. They can slip/pop out of your hand if you're not careful. Plus, your hand cramps from having to grip it so tightly. I bought these based on reviews but myself and staff agree we need to find something else. We are sorry you did not prefer this product. For recommendations, please contact our Customer Solutions team. The 7" Heavy Duty Stainless Steel Utility Tong is a great buffet option. The Tongs are a little difficult house at first but seem to slack up after a few uses. Great for a salad bar or buffet. This is the thid time ordering these tongs we have about thirty and never broke one. They are very durable and heavyduty stainless. nice small pair of tongs, we use these a lot and they take some decent abuse, they hold up well and recommend them to everyone. These tongs are a good value at a fair price. They do meet the demands of our busy kitchen and can be used on buffet lines and front of the house applications. They present well. The TONGS are a great value. Easy to clean and perfect for fetching fried foods. The 7" size makes it easier to place near fryer without utilizing much counter space. Didn't know they made a pair tongs for the small I prefer the short tongs over the long ones they're good well-made song I like the fact that they are completely rolled around and there are solid type pong and don't have a groove in the middle where your finger can get pinched in some times. These are a little smaller than expected but they still work perfectly for our needs. They are easy to use and to clean and store. These are cute little tongs that are better looking and heavier than the tongs offered under the "serving tongs" section. We use them mainly to serve appetizers. Just the right size for that. This 7 inch heavy duty stainless steel utility tong is very well made and feels good and sturdy in the hand. This size has been great to handle small sliced vegetables like cucumber and tomatoes. Great tong not just for buffet but we also use them in the kitchen. Price and quality are outstanding. And size is just right to your hand. Just as you'd expect. It's a great heavy duty tong that should last forever. I bought several and use them for all types of duties. These tongs are a nicer guage stainless steel, and serve their purpose well, however they are a little bit stiff for people to use if they are older and don't have strenght the squeeze the tongs together. They are exactly as the specs state they are and are shiny and nice looking on our banquet lines. Really great little tongs! They are very solidly built and have a really heavy duty spring in them! Great for small kitchen jobs and for serving! These stainless steel tongs are a great buy. They are strong and durable and last forever. They're easy to use, easy to wash, and our cafe staff loves them! I was surprised at how firm the spring is and I think that's a good thing. They are short and firm so handling donuts and other baked goods is easy. Lots of control. Very happy customer. Using these tongs for many different events, party's. They are heavy duty, excellent quality and perfect 7 inch for many things, like serving a buffet. I love the smaller size since will use more often than reg. 9 inch size. Exceptional pricing and customer service. Some of mine arrived scratched and they are replacing them immediately for me. Just ordered 24 tongs and will be ordering more soon. Great utility tongs, great price. I ordered a bunch of these for my coffee shop and they work great and are holding up well. They wash nicely too. These 7inch heavy duty tongs are great for smaller portioning. They also can be used for other purposes such as flipping steaks or chicken. Very sturdy as well. Used the 7" Heavy Duty Utility Tongs to pick up baby carrots. These heavy duty tongs had no trouble picking up the baby carrots. So easy to use and precise. these 7 in heavy duty tongs were awesome! we are very pleased at how quickly they were shipped, at the low price, but great quality of these tongs. we have not been able to find them anywhere for a better price! Love these tongs! Sturdy construction and nice finish. These are replacements for plastic tongs that just were not holding up. These seem like they will last quite a while. We will be purchasing more of these. Tong is super strong and durable. Made of thick stainless steel material. It is easy to use and can pick up light and heavy food items. I bought these utility tongs for use in buffets and gatherings. They look very nice on the buffet table. For the price, you can't get a better value. this tong is very hand.y. it's very compact, so I just take this whenever I go to the potluck party. It's great to grab small baked goods like cupcakes and muffins. These utility tong is perfect for my salad bar or Bruschetta Bar, they will last for a long time due to their quality, I defenetly recommend them. the 7" Heavy Duty Utility Tongs are pretty darn tiny, what this tong lacks for in size is definitely made up for in durability and quality of construction. I love these small tongs. I did not realize they were small when I ordered them, but after I got them, they are great. I use them to serve salad. They are perfect and because they are small they don't hang over the platter. Great tongs for flipping bacon or roasting veggies. These tongs are easy to control without fatigue setting in. The larger ends make it easy to manipulate larger items while cooking. We use these for serving baked goods out of our deli case and they're the perfect size to pick up most jumbo muffins, scones and pastries without damaging them. These utility tongs through Webstaurant.com are replacing the ones I have been using. These 7" tongs are very heavy, look great and feel good in the hand. These are great for small jobs, like grabbing ice cubes. Tonight, I used them to serve shrimp. They don't have a mechanism to keep them closed when not in use, but I wouldn't expect that with such a small price tag. These are solid with a good spring...Great deal for the price. These utility tongs are great. They have the shorter handle on them, but it is handy when working in tight areas where the longer handles are too long. Great for using on small cold items that are ready to eat. Keep a good spring to them and are space saving. I would recommend these to anyone with a sandwich station or salad bar. Very nice quality tongs, they have a well balanced feel and should last a very long time. They are nice and thick so they shouldnt bend easy. They are very small though. When they say heavy duty they meant it! For the price the quality is great. I figured they would be similar to what you get in the stores a weak spring, but not these. Not that they aren't great for the price, but they feel very flimsy. I still use them and they have yet to actually break, but every time I pick up something like a pork cop I wonder if this is the end. These were a little smaller than I thought they would be.but turns out they work very well for serving rolls or any type of bread. These little dudes are super sturdy and have very stiff spring-action which will hold up well for repeated buffet use. They stand up well to frequent dish-washing and the price is definitely right. These are great little tongs for serving platters and for self serve meals. They feel of good quality and are hold up with for me. I expect to get years of use from them. Very pleased. I am a loyal customer for this website. I ordered this tong nit only cheap but also good and commercial quality. Always recommend this website. Perfect size tongs for buffet. The heavy duty is a big plus. Used the tongs at numerous family events and gatherings. Friends and familys loved them also. Great little utensil and very useful. Feels even sturdier than the 12" one. It is a little hard to close if you're gripping too far back so not very useful for grilling but great for serving. Only downside to these is that they don't come with a latch to keep it closed so they're a little awkward to store. I bought this for a conco de mayo/fight party we were having. We used them for our taco bar toppings. They are definitely heavy duty and great to use in small bowls. These are great tongs to use for precision grabbing. We use them on delicate foods and to remove foods from the toaster, waffle iron, muffin pans, etc. Overall a good quality product. The tongs are heavy duty and are at a good price. The only down side is the 7" length limits the distsnve you can work from. These tongs are better for cold side work. Great tongs. I underestimated how small 7" is, so make sure you really pay attention to the pictures before you order. If you are not wanting a long handle to deal with, these are perfect for you. I found great use for these while cooking chicken (or any other kind of meat) on a skillet. These small tongs are VERY durable. I've used them for over about a year now and they haven't worn at all. Nice smaller size for picking items out of 6th pans. Very durable and solid. Has a nice feel to it. My kids love using them as these are smaller size tongs and feel more comfortable in smaller hands. Great for employee meal time, just the right size as not to interupt the cooks and allow the other employees to get their food without using one of the cooks utensil. This item is a must for each kitchen. If you don't want to long of a handle these tongs are great. We used many for hot foods like ham bbq so not a lot of juice on plate. Easy clean up. Good solid tongs. After about a year of daily use the spring in the handle gave out and broke, but for the price it is still pretty goos. They feel good and solid in your hand. If your grilling i would recommend a longer size but these are perfect for anything else. Perfect tongs for prepping things like salad, where smaller to larger amounts of ingredients have to be grabbed and mixed. I love having these at our prep stations. First, these are really good quality. Second, these are very small! They are not good for anything that is too hot or splattering, as your hand will be very close to the food. They are good for picking up muffins or cookies or waffles. Mostly my youngest uses them when she helps me in the kitchen. It's rare to find tongs of this small size that are built for heavy duty use. these tongs are made of thick gauge stainless steel that hold up nicely without any warping or bending. The small size provides a lot of control and delicate maneuvering. These tongs are strong enough to firmly grasp a whole chicken and pull it out of a stockpot when making broth. We use these tongs mainly for serving buffet items. They are comfortable in the hand and very durable. It is worth the small amount extra to purchase the heavy duty tongs. These tongs have a nice heavy feel to them that screams quality. The shorter handle allows you to use them as serving tongs as well. The price here is much lower than our local restaurant supply store. Tongs! You can never have enough of them... these are what I would consider medium duty not heavy duty by far, but they do fit the bill for what i needed them for, and they were cheap, so hey! Ordering from Webstaurant is always a breeze. 2-day shipping is awesome. The tongs are made of nice metal, they feel good in your hand. They are small enough but grab as well as a bigger size tongs. We have gone through several flimsier pairs of serving tongs, so we got these to use for buffets. Their size is good for 1/9 pans of product, and they still function and look fantastic. I purchased these thinking they were standard size but realized after receiving them that 7" is quite small (my bad). That being said, they are very good quality and sturdy. I wish all my larger tongs were as nice. We use them at a salsa bar self-serve station and they serve their purpose well. I was very surprised when I got these in yesterday. I was afraid to order them online in fear of getting some really cheaply made thin tin foil type of tongs... Not these. Heavy duty and reliable. These will be used on my condiment station for customers to put on their own onions, jalapenos, pickles, etc. They are small enough to handle the fixins and easy for the kids to use em too. These little tongs are nice and sturdy. The spring is a little tough though, rather difficult for me to squeeze and maneuver. Maybe this will get easier with use? And I really wish I had ordered the longer ones, maybe 9-10 inches. They are too short for most jobs - including getting things out of a hot sautee pan. But they do the trick for grabbing small quantities out of the sandwich station containers. Thank you for your review! We're sorry to hear you find your tongs difficult to squeeze and too short for most jobs. For longer tongs, try these 10” Heavy Duty Tongs. These are great tongs! They truly are heavy duty & I couldn't believe the price! I now know where to come when we need more! Great quality again from the Webstaurant store. I made a little mistake thinking this was 7" handle not 7" total length, so when I received it was surprised at how small it was. But that is totally fine! I have use for a smaller pair of tongs. These tongs are perfect for mixing and applying dressings to individual portions of salads. The small size is also convenient for plating delicate greens elegantly. The price was.Great I would reorder these tongs again. I think the quality of the product hold up very well to heave useage. I approve of this product. These tongs were exactly what we ordered and they work very good. We were able to save a lot of money buying online rather than normal purchasing routes. Very sturdy tongs which hold up well under heavy use without warping or excessively flexing. This size is perfect for saute work or for serving hot food. These tongs are shorter than most and our restaurant staff loves having them around as an alternative to longer tongs. Great for handling smaller items used in salads. Nice size for multiple uses. Please take the time to remove the stickers from the tong BEFORE you wash them for the first time! These are heavy duty and look sturdy for years of use. These small tongs are perfect for home or professional use. We carry a dozen of them to every catering event to either use as part of an hors d'oeuvres display, or to use with our replenishing trays. Perfect size and amazing quality! These are the perfect size for me when I do my cooking classes. When doing something individual on one burner in from of you, you don't need anything larger. Seven inches is a little small for commercial use, or for reaching over one burner to the next. These tongs are smaller than your typical tong but they were perfect for my buffet tables! Great for use by kids and adults. Impressed by its durability and quality! Good quality. The size is perfect, not too small, not too big, just perfect! i don't think you can find anything better than this. I will buy more. We ordered multiple sizes of these tongs to have in the kitchen. They are used for multiple purposes, these are smaller than I pictured, but they are very handy to have around. We found these to be perfect for a salad bar or on a buffet. They are smaller and durable. Not flimsy at all. Great for Veggie Trays or small sandwiches. Good length and durable set of tongs. Have had them for a multiple years and have been good. No ring on top too keep them closed but it really isn't an issue. Great item. Not too short and not too long. Very sturdy. People try to steal these frm my collection too. They are very sturdy. Would buy again. These 7 inch tongs work great for small jobs. From turning fried food in a pan, to serving food on the table, these tongs are great, and since they are so small they are easy to store. Great tongs for low mein as all my customers tell me. The 4'' ones were too short so they requested these and for that purpose they work but even for the grill etc. Perfect. I should have measured but these tongs were super small. They may be good for ice. The price was ridiculously low so there is no loss and we'll find a use for them. With such a great unbeatable price, these tongs are a must have! Great to buy a lot of! Good for all sorts of uses in and out of the kitchen! I originally bought these tongs for guests to serve themselves from my chafers at my dinner parties, but I now find myself reaching for the them almost daily in my kitchen for food preparation. Very inexpensive and is so helpful to have in the drawers. Just the right size to put with vegetable and cheese trays. Cleans up well and can be reused. Dishwasher safe and a top notch quality tong.